What is a Private Panel, when should you use one, and how does it work? If you want to run UX testing with your actual customers (and not just people who are like them), you can recruit your very own user panel to the WhatUsersDo platform to test with. We call this a Private Panel, as anyone you recruit using this method will be completely exclusive to you—think of it as your own personal tester base! 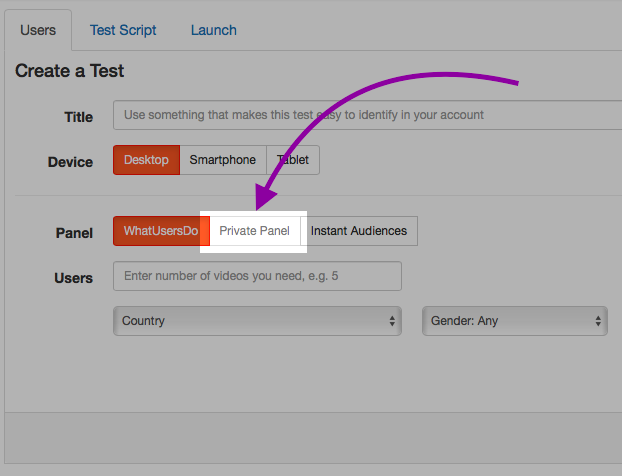 You'll get your Private Panel all to yourself — your folks will remain separate from the main WhatUsersDo panel and cannot be used for testing by WhatUsersDo or our clients. Unlimited plan customers: If you're on an Unlimited plan, you already have a Private Panel option included! Just get in touch with your Customer Success Manager to find out more. Get in touch with us to find out about recruiting your own Private Panel!